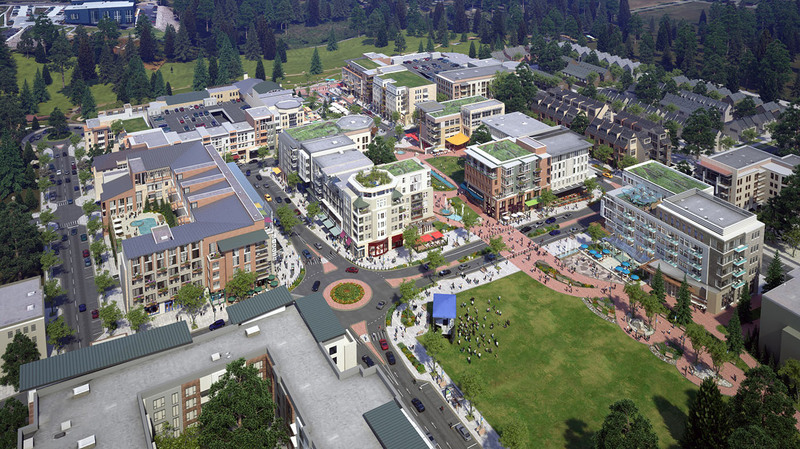 The Sammamish City Council faces a complex set of issues interconnecting the Town Center and efforts to revise its traffic concurrency policies. At stake is whether the Town Center proceeds per the 2009 plan adopted by the Planning Commission and City Council or, as some desire, the plan is reopened with the goal of down-sizing it. Reopening the plan also allows the possibility of some advocating an up—zoning of the TC. The city is under a building moratorium adopted last October. The council and staff want to lift the moratorium in July, but controversy over how to proceed with revisions for concurrency casts doubt over whether revisions may be ready by then. The Town Center plan allows 600,000sf of commercial-office-retail (COR) space and 2,000 residential units. Previous city councils approved Transfer Development Rights into the Town Center, boosting approved units to more than 2,200. The Environmental Impact Study conducted before approval of the plan was based on 700,000sf COR space and 3,000 residential units. Any more than this and a Supplemental EIS would be required. The commercial and residential areas under construction on either side of 228th Ave. SE represent a small portion of the maximum allowable. Developer SCTA owns or has under contract more than 70 acres, which is most of the developable land in the TC, but has yet to submit applications for development, including COR space and residential units. STCA’s plans are a bit of a moving target in the absence of an application. In March, Matt Samwick, the head of STCA, outlined the company’s general plans to the Sammamish Chamber of Commerce. He announced a letter of intent with Ace Hardware to become an anchor tenant in the commercial development on the top of the hill on SE 4th St. The same day, Innovation Realty Partners, which is affiliated with STCA, announced $30m in financing from The Benaroya Company for the development. The Benaroya investment and Ace LOI provide credibility to STCA and Samwick, a controversial figure whose own credibility comes under fire by critics on Facebook, notably Miki Mullor. Mullor last week was named deputy editor of Sammamish Comment. He did not contribute to this article, the research for which has been underway since March. He did provide certain information contained in this article. Samwick, at the Chamber meeting, agreed to an interview with The Comment. He subsequently canceled the date through his public relations representative. Efforts to reschedule the interview several times were unsuccessful. The Comment wanted to discuss additional financing sources, more detailed plans and Samwick’s checkered past. Samwick was a lawyer in Oregon who resigned the bar rather than contest state bar charges he improperly used more than $3m in funds from investors. Two investors sided with Samwick while others filed complaints with the state, according to a 2008 article. Samwick’s background was unknown to nearly all the current city council members until information began appearing on Facebook and council members were contacted directly by concerned citizens. City manager Lyman Howard wrote in an email to the current council that Samwick’s past had been investigated and vetted when he first approached the city about developing in the Town Center and that he had been forthcoming about the Oregon troubles. The information was shared with the previous council, Howard said. Ramiro Valderrama is the only member of the current council who was on the previous council that was briefed. The building moratorium, adopted last year, was an emergency action by the council; no notice was given to the community or developers, including STCA. This was interpreted by some as an undisguised threat of legal action. In subsequent emails, Samwick denied making any such threat even though one council member quoted Valderrama in an email as saying Samwick had made such a threat. The moratorium was enacted when Mullor, in June 2017, raised serious questions over whether the city’s concurrency model had been manipulated to avoid failing any development request. Mullor, in his first foray into public advocacy, was sharply critical of staff and their motives. At the time, Howard denounced the study as “deeply offensive” and “inaccurate.” But he scheduled a review by the city’s traffic consultant and staff that, in the end, validated Mullor’s underlying thesis that the concurrency model was crafted in favor of approving project applications. Traffic concurrency is required by state law. This means that roads must be able to accommodate growth in a “concurrent” manner. Concurrent in this context means either improving the roads/intersections at the same time as the development or having a financial plan to do so within six years. Led last year by council members Tom Odell, Christie Malchow and Tom Hornish, technical and policy flaws were revealed, including the fact that staff and the outside traffic consultant simply ignored adopted policies in creating the city’s traffic concurrency modeling. The modeling had been in place, with revisions and updates, since adoption of the city’s first Comprehensive Plan in 2003. With growth in Sammamish and outside the city limits that affects the city, traffic is gridlocked on certain arterials during rush hours, notably East Lake Sammamish Parkway, Sahalee Way, 228th and Issaquah-Pine Lake Road. Issaquah-Fall City Road was annexed to Sammamish in January 2016 with Klahanie. It, too, is gridlocked during rush hours. Concurrency historically has been a two-part test: the volume of traffic on the road capacity (called the V/C ratio) and the wait time at intersections (called the Level of Service, which is labeled as A through F). The current city council, after much debate, directed staff and an outside traffic consultant to come up with a new concurrency plan based only on intersection LOS calculation. Mullor objected that instead the new concurrency model should be based on time-travel, contending this is the most realistic way to measure traffic congestion and traffic impacts from growth. When staff recently presented the proposed LOS-based concurrency revisions, the flaw of this method was readily apparent. Staff contended that traffic flow through intersections throughout the city actually improved between 2014 and 2016, despite new growth within Sammamish and impacts of new growth on the choke points outside the city. Traffic counts through intersections declined and so did wait times, the staff claimed. Traffic counts through intersections may decline for any number of reasons, not the least of which is traffic was diverting to other routes or flawed modeling inputs into the “black box.” Staff and consultants, it turned out, had not validated the modeling before presenting it to council—an inaction that is inexplicable. The council sent the project back to staff for validation, if possible. But the clock is running on the self-imposed July deadline to lift the moratorium. If the validation and modeling isn’t completed by July, or the council finds it unconvincing, will the council decide to keep the moratorium to its October expiration? It could also be renewed at that time. Or will there be four votes to lift the moratorium in July, as intended? The vote will be crucial to STCA and its development plans. If the moratorium is not lifted, there is nothing STCA can do except wait the moratorium out—or sue to have the court order Sammamish to lift it. If the moratorium is lifted, what concurrency model will be in place? The one the city knows is flawed, or the proposed LOS-based model that as of today is not validated and may be flawed in its own right? Either way, if STCA is ready to file its application in July if the moratorium is lifted then, the application is vested to whichever model is in place. There are discussions of possibly reopening the Town Center plan for reconsideration. How this would be done in the next few weeks or months is not clear, for this should require a Comprehensive Plan amendment process and this doesn’t happen until fall. One group advocating reopening the plan favors down-sizing it. This has all sorts of implications, including property “takings” under the US Constitution. Another group of property owners within the Town Center are ready to advocate a dramatic up-zoning, including as many as an 8,000 unit maximum. STCA at one point pondered a major up-zoning request of its own. The idea was killed before a formal proposal was made. The city council is faced with a dilemma of nearly impossible choices: retain the status quo of the Town Center plan, retaining the traffic impacts that were, in retrospect, based on flawed data; down-zone and face almost certain lawsuits for “takings” and damages; or up-zones, exacerbating current traffic problems. The last is a non-starter with this city council. The first two clearly fall within the damned-if-you-do and damned-if-you-don’t arena. There is a court case directly on point to the “taking” issue that concluded the downzoning was not a taking: Land Use case. Great Article! I suggest that the City Staff and also Mullor and company get out and verify the data in the next month before school gets out. If they don’t do it before then they will need to wait until September (Summer Months data is inaccurate due to school being out) to verify the numbers which means keeping the moratorium in place until verification takes place. Who from the city did the vetting of Samwick? It appears they are not doing their homework. Very similar to the flawed concurrency issue. The city’s operation is looking more like King County all the time. Why did we incorporate? Again, unable to use common sense. What will the traffic flow be? Are they trying to compete with Seattle – ME TOO. Yikes. Please explain how the current concurrency methodology is flawed? Mayor Malchow, council member Hornish and, of course Miki Mullor claim it to be flawed but again, how is it flawed? Saying it is does not make it so. Obtaining high impact fees from developers, is this a flaw? Getting developers to provide complete streets (curb, cutters, pedestrian walkways, bike trails, and safety, is this a flaw? Improving intersections with turn lanes, better signalization, is this a flaw? Being one of the most innovative systems in the region, is this a flaw? Using four out of six best practices for concurrency, is this a flaw? Incorporating nationally recognized, tested traffic demand model engineering tools, is this a flaw? Updating the model with data on a scheduled basis as well as running data from new developments to calibrate and validate the model, is this a flaw? Mr. Mullor never addressed specific “flaws” in his June 2017 diatribe against concurrency. He attacked staff and claimed that they manipulated outcomes. Mullor claimed that since concurrency didn’t stop all growth it was flawed. What he didn’t understand or deliberately elected to ignore, is that concurrency demands mitigation and that it is not intended to stop development but to ensure that development pays for development and that transportation infrastructure (multi-modal transportation) keeps pace with development. Mayor Malchow went out and made a few measurements and claimed that compared to measurements made by staff and consultants, her measurements were accurate and staff/consultant measurements were wrong. Based on this, she declared the entire concurrency program to be “not working.” Very little logic here. If my smartphone GPS misses a street turn do I throw out my smartphone? (We are not working with perfection but within a managed margin of error.) Staff have explained that for each development real life checks are made if there are indications a problem exists. And, of course, there are opportunities for citizens to participate in the process. How well did Mayor Malchow understand concurrency, V/c calculations, LOS, Traffic Demand Model, link to comprehensive plan land use and transportation elements, financical cost of the concurrency program? If the Sammamish Comment wishes to post any of these video clips they can be provided. In conclusion, one, unsubstantiated claims that the City’s concurrency program is flawed and should be completely replaced are part of an attempt to sabotage the city’s town center. The current program has many strengths that can be built upon to make an even better program. This is the intent of the Transportation Master Plan that has been delayed by the hysteria surrounding the concurrency sky is falling. Mr. Hornish’s attempt to throw out his proposed changes to the concurrency program and start all over again and to extend the moratorium was a clumsy attempt to sabotage the town center. Two, compare the town center EIS and SEPA traffic analysis to current concurrency and the revised concurrency process, the town center EIS and SEPA are more demanding and more detailed than what is required now. AM counts used as well. Level of Service similar…Actually, after spending ten months and $400k of taxpayer dollars, the revised concurrency program is a step backwards not forward. So much more needs to be written, problem is most people no longer read. The majority of people who read this blog seek opinions that reinforce their beliefs. What we need is genuine dialogue and learning. Reopening the town center plan is just another attempt by a small group of ideologues to sabotage the city by destroying the town center. Those who oppose the town center are attacking our city not protecting it. Now, the calm before the storm. 1. The model was designed to never allow any test to fail.It was a rigged model. 2. The staff and traffic consultants ignored published policy to use AM or PM traffic, whichever was worse. Only PM traffic was used. 3. Segment averaging was used to allow concurrency testing to pass. Without this, it was acknowledged, there would have been failures. 4. The Malchow measurements proved key staff measurements were false, artificially adding to capacity. These are other failures were duly reported here. I agree the proposed plan is a step backwards. It also has fatal flaws. All that said, I called for the Town Center to be exempt from the moratorium. Also that being said, the deliberate falsification of the original model needed to be exposed. The fatal flaws of the new plan need to be exposed. What happens next is a matter of discussion. 1. The model was designed to never allow any test to fail. It was a rigged model. Where is Holmes and Watson when they are needed. A statement such as this invites evidence. To make this claim one certainly needs inside information. Where is the whistle blower hiding? Watch out Wikileaks, you have competition. Does Seattle have an Ecaudorian Embassy? Please describe how this model was designed to never allow any test to fail. Be as technical as possible. Who paid the independent consultants to rig the model development by development. What motivated staff and consultants to manipulate a very complex engineering tool to produce a false outcome? You are suggesting that there is a grand conspiracy. Boring Sammamish needs a good conspiracy. Town Center transportation analysis included AM and. PM. Data indicated that the difference between AM and PM was within 1%, to save money and time, a decision that was included in a comprehensive plan update was made to only use PM. peak times. Common practice is to use PM peak times. Wrong, segment averaging was not used to allow concurrency testing to pass, but to incentivize developers to provide complete streets (curb, gutter, bike trails, safety, etc.). Keep in mind the principal of proportionality. Fatal flaws are strong words. but then again, controversy keeps people clicking. Discontent needs regular nourishment. Finally, how was it you beat King County with concurrency data. Is King County burdened by ethical principles but Sammamish is not? Was there concurrency model unbreakable, not to be corrupted by evil people within King County. Want to be popular and do a lot for Sammamish traffic during morning peak times? Get the high school students to ride buses, bike or walk to school. Go at this one Mr. Mullor. Negotiations with North Korea, Palestinian deaths, net neutrality, government and private debt in the trillions, health care reform. who has time for these minor concerns when we have concurrency AM or PM. and traffic congestion in Redmond and Issaquah. I’m sure many people round the world would love to have our problems.